Bill Burkette, the original lead baritone for the Vogues, died on Thursday (March 2) from lymphoma in Penn Township, PA. He was 75. The Vogues were formed at the High School in Turtle Creek, PA, outside of Pittsburgh, in 1958 with Burkette, Don Miller, Hugh Geyer and Chuck Blasko. Originally called The Val-Aires, they were picked up by the Willette label which released their debut single "Which One Will It Be" / "Launie My Love". The single received strong support locally and was picked up by Coral Records for national distribution. Post-high school, members of the group entered the military but, when their stints were complete, the group reformed. Bringing in Nick Cenci, who had worked with Lou Christie, the group recorded a demo of their cover of Petula Clark's "You're the One". 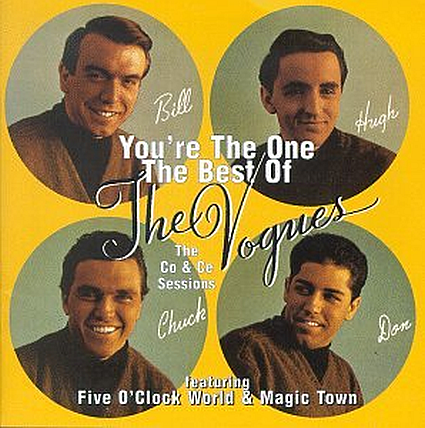 Initially released on their own Blue Star records, it eventually went national on Co & Ce, who changed their name to The Vogues, reaching number 4 in 1965. They followed later in the year with "Five O'Clock World" which also peaked at 4. Follow-up singles charted lower and lower until the group couldn't even make the Hot 100 in 1967 and early 1968 but Co & Ce made the decision to lease the group to Warner Brothers/Reprise who took the group in a slightly different direction, giving them a smoother vocal group style ala The Lettermen and having them record older songs. The results were two more top ten hits, "Turn Around, Look at Me" (1968 / #7 Pop / #3 Adult Contemporary) and "My Special Angel" (1968 / #7 Pop / #1 AC) along with a number of lesser hits that scored well at AC including "Till" (1968 / #27 Pop / #5 AC) and "Woman Helping Man" (1969 / #34 Pop / #6 AC). During the 70's, the group recorded for a number of labels including Bell, Mainstream, and 20th Century. Burkette left the group in 1983. He went on to be a sales manager for a home improvement company in Murrysville, PA but, in 2008, rejoined the official version of the Vogues and stayed with the group into 2017. Burkette is survived by his wife, Elaine, two daughters, a son and three grandchildren. Bill will forever be memorialized, in every workingman's song "Five O'clock World". He was an amazing voice of the 60's. (ps: Bill is in the upper left of that graphic, with the Vogues). R.I.P. Mr. Burkette.